Eastern Wyoming College, in conjunction with the Goshen County School District, is sponsoring “College for a Day”. This program will be held on the Eastern Wyoming College campus in Torrington on Thursday – May 19th from 9:00 am -1:30 pm. The purpose of this program is to spark interest in young children about attending college after high school, and familiarize these students and their parents with college life. It will provide information to students about the possibility of attaining a college degree regardless of income or other life circumstances. The conference is funded by Eastern Wyoming College with assistance from the EWC Board of Trustees and the College’s President, Dr. Tom Armstrong. Fifth graders in the Goshen County School District along with their parents have been invited to the program and an attendance rate of around 175 is expected for the day. The conference will have academic presentations designed for children with separate sessions for parents on ways they can become effective partners in their child’s academic success. Keynote Speaker, Mary Jo Huelle will start the day with the presentation “Instead of Why? Why Not” in which she will discuss the positives and negatives of going to college. Ms. Huelle has taught in Nebraska and Tanzania (Africa) and will discuss, among other things, opportunities for volunteering in college including service in the Peace Corps. Student sessions include individuals/organizations from both EWC and outside the local area. Therapy Dog, Inc., a national organization with corporate headquarters located in Cheyenne, WY, will present “Reading to Your Pet”. The goal of this session is to present students with the idea that reading to their pets can be fun (both for them and their pet) while, at the same time, helping the student increase confidence in their reading skills. Another presenter will be Aimee Summers who is a former zookeeper. Ms. Summers’ topic “Cryptozoology : Fact or Fiction” addresses the subject area (the search for animal whose existence has not been proven) and related stories. Topics discussed by EWC faculty include “The World of Welding” (Leland Vetter – Machine Tooling/ Welding Instructor); Education and Athletics (Verl Petsch – Athletic Director); and “The Art of Collage” (John Cline – Art Instructor). Presentations for parents include “Exploring Financial Options to Meet the Cost of Higher Education” presented by the Education Opportunity Center of Southeast Wyoming; “Social Networking” by Brian Hale from Hale Media in Gering, NE; and “Preparing Your Student for College” by the EWC Enrollment Management staff. Parents are encouraged to attend any or all events and have been invited to stay and have lunch with their students. The day will conclude with a presentation from Laure Sinn who is the Director of Student Activities at Chadron State College located in Chadron, NE. In addition to a snack and lunch, students will receive an EWC book bag and other academically related items to remind them of the day and help them start on the road to a college education. Eastern Wyoming College recently held a reception to recognize and honor employees for their years of service to the College. President Dr. Tom Armstrong congratulated and thanked each person for the contributions they have made to the College. Those employees who will be retiring from the College this year were also recognized. Retirees include Wayne Deahl, 22 years, Communication Instructor; Marilyn Miller, 21 years, Librarian; Patti Sue Peterson, 33 years, Veterinary Technology Instructor, Division Chair; and Connie Woehl, 13 years, Associate Vice President for Learning and Outreach, Division Chair. Receiving recognition for 40 years of service to the College was Verl Petsch; for 30 years, John Nesbitt; for 25 years, Cheryl Raboin; for 20 years, Suzanne Andrews, Sue Schmidt, Geri Lewis; for 15 years, Ellen Creagar; for 10 years, Karen Parriott, Ed Bittner, and Susan Walker. The students of the Eastern Wyoming College Block and Bridle Club announce the winners of the raffle held this spring. Students sold tickets for half a hog and the winners were Lori Moore, Torrington and Tony Gonser, Custer, SD. The hog for the raffle was generously donated by Chapman Show Pigs, Jeff Chapman and family. The students appreciate the support and donation. Funds raised by the Block and Bridle Club are used for educational trips, the Range Cow Beef Symposium and for various campus activities. The Club also held a trick or treat for canned goods last Halloween where they donated all food collected to the local food pantry. For more information about the Block and Bridle Club at EWC contact Dr. Monte Stokes at 307.532.8273. Gering native Riley Pruitt, freshman, will represent Eastern Wyoming College at the College National Finals Rodeo to be held in Casper, Wyoming in June. Pruitt consistently lead the Central Rocky Mountain standing in the tie down roping all year and finished with a regional championship. The Lancer Rodeo team just concluded their season in Laramie at the final rodeo hosted by the University of Wyoming. EWC freshman Tee Hale, White Owl, SD, won the steer wrestling with an overall time of 7.5 seconds on two steers. Troy Wilcox, sophomore, Red Owl, SD finished the weekend in 2nd place in the tie down roping with at total time of 21.9 seconds on two runs. Sophomore Charlie Opela, Stapleton, NE, put together two great runs with a total time of 5.8 seconds, landing her in 4th place for the weekend. At the conclusion of the rodeo season, contestants and officials selected the Lancer Rodeo at the Central Rocky Mountain Region “Rodeo of the Year.” This production is put on by members of the EWC rodeo with support from the EWC faculty and staff and the Goshen County Community. “It is an honor to be selected as rodeo of the year. It is a great compliment to the College and the community,” added Clark. EWC students recently traveled to Casper to compete in the State SkillsUSA competition. The results were as follows: Individual welding competition, sophomores Blake Parks, Douglas, WY placed 1st, Tanner Tipsword, Cheyenne, WY placed 2nd, and Trae Seebaum, Douglas, WY placed 3rd. Blake Parks qualified for Nationals in individuals. First place in Welding Fabrication went to the EWC team of Blake Parks, Gus Wilkinson, freshman, Alliance, NE and Trae Seebaum which qualified these students for Nationals in Kansas City in June. Riley Pruitt has earned his trip to the College National Finals Rodeo to be held in Casper, Wyoming in June. A win at the Casper College Rodeo put him out of reach to his competitors and assured his spot. He was 1st in round one and 1st overall for the weekend. Pruitt is a freshman from Gering, NE. Teammate Troy Wilcox, sophomore, Red Owl, SD finished the tie-down roping 3rd overall behind Pruitt. They are currently 1st and 4th in the regional standings. Torrington native Colby Sturgeon, freshman, along with partner Will VanHill of LCCC finished the weekend 2nd overall in the team roping. The next and final rodeo will be held in Laramie, hosted by the University of Wyoming. The Eastern Wyoming College Foundation has announced the winners for the Foundation’s annual awards for recognition. The Distinguished Alumna is Dixie Roth and the Distinguished Service Award winners are Guido and Edie Smith. Roth received her Associate of Arts degree from EWC in elementary education in 1982, and followed that with a BS in Elementary Education from Chadron State College in 1984. Ms. Roth currently teaches 5th grade at Trail Elementary in Torrington. She has a long history of service to the community including involvement with 4-H, the Goshen County Fair, Goshen County Cattlewomen, Prairie Center Firefighter, Sunday school teacher, member of the EWC agriculture advisory committee, and memberships in the Goshen County, Wyoming, and National Education Associations. Her 24 years of teaching have included 18 years at Prairie Center, and six years at Trail Elementary. She has received many honors and awards in her career, including Phi Alpha Theta Honorary, Casper Star Tribune Golden Teacher Award, Goshen County School District #1 finalist for Teacher of the Year, FFA Honorary Degree, 4-H Leader of the Year, and recipient of the Wyoming Honor Scholarship. Both of Dixie’s children, Sarena and Rustin, earned degrees from EWC as well. This is the first year the EWC Foundation has awarded a distinguished service award. This award recognizes exemplary achievement in service and support of Eastern Wyoming College. The first annual EWC Distinguished Service Award for 2011 is awarded to Guido and Edie Smith. The Smiths came to Torrington from their native Kansas in 1958, the year that Guido began teaching biology at Goshen County Community College. Since that time, few have served the College and the community as they have. While Guido was working to build the College through his more than four decades of service, Edie also made important and lasting contributions to its well-being. This award truly requires that both of these wonderful people be recognized together. Throughout Guido’s time at the College, Edie was always ready to work on campus projects and to host groups of local and state officials with humor, intellect and vitality. Edie has a long and successful career as a teacher in Goshen County schools yet still found time to prepare gourmet meals for College events hosted in their home. Guido’s work on behalf of students in this region has been unmatched. He began teaching biology at EWC in 1958, and worked through a variety of positions including teacher, basketball coach, dean of instruction, occasional horticulturalist, and eventually president – a position he retired from in 1990. He has additionally served as a member of the EWC Foundation Board of Directors, retiring from that position in 2009. There are only a handful who can be said to have truly been the “heart and soul” of their college. Guido is one of those – in fact, when people think of Eastern Wyoming College, they are often really thinking of him and his impact on this institution’s growth and success. Guido and Edie regularly attend multiple events at the College and continue to hold the institution and its mission near to their hearts. They are thoughtful, committed people who continue to exemplify service to their community and their college as few do or have done in this area or statewide. They are truly deserving of the first award from the EWC Foundation for Distinguished Service. Both Roth and the Smiths received their awards at the EWC Commencement ceremony. 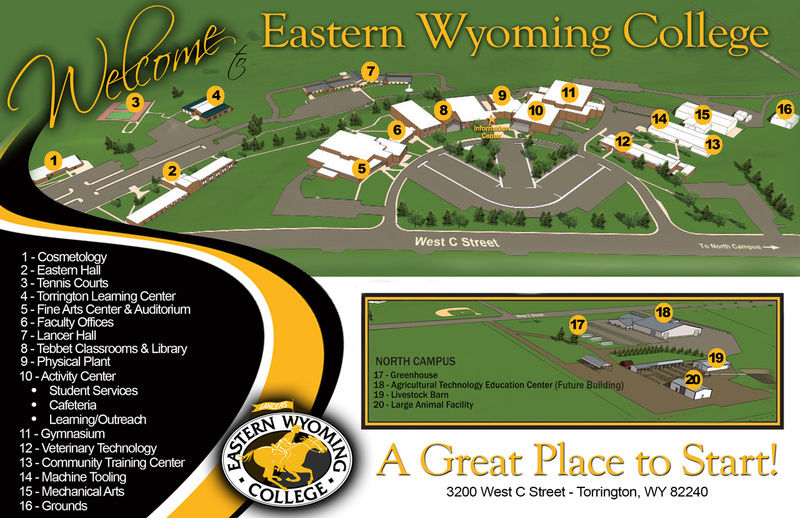 For more information about the Eastern Wyoming College Foundation, contact Oliver Sundby at 307.532.8304. What’s really under the roof will be the topic of discussion at an upcoming symposium to be held at Eastern Wyoming College in Torrington, Wyoming. Financing and hidden benefits of energy efficient homes in the Platte Valley will be held on Thursday, May 12th, from 8 am to 2 pm in the EWC Auditorium. This symposium is free and open to the public. Co-sponsor for the event is the Platte Valley Board of Realtors. Registration will begin at 7:45 on the 12th with a welcome provided by EWC Division Chair Rick Vonburg at 8 am. Brenda Ilg, Program Manager for LIEAP and WAP, will provide the first session entitled Weatherization 101. This session will feature weatherization work being done in Wyoming as well general information about weatherization. The second session will be presented by Steve Lieski, owner of Harmony Heating and Solar, and is entitled Marketing Energy Efficiencies to the Consumer – Why Realtors should care about Home Performance. Christian Pritchett, Wyoming Community Development Authority, will present a session on Retrofitting Your Home While Navigating the Red Tape and Paperwork. This session will be followed by Jennifer Crawford, Wyoming Community Development, as she shares information on the Wyoming Energy Savers program. Lunch will be provided and following the lunch break, Milton Geiger, Energy Extension Coordinator from the University of Wyoming Cooperative Extension Service, will present on the Incentives and Financing available for Energy Efficiencies and Renewable Energy. The day will be concluded with a session presented by Tim Nyquist, EWC Weatherization Instructor. This interactive session and will introduce the audience to the science behind weatherization and the tools used in the weatherization process. He will also share a follow-up session on the symposium. For more information on this conference or to pre-register, please contact Ashley Harpstreith, EWC Workforce Development at 307.532.8366 or email her at workforce@ewc.wy.edu.